For the past two days I’ve been fighting with vDP not showing up in my web client. I’ve stumbled across server solutions which include rebooting vCenter, rebooting vDP or any combination of both. For many users this has worked, for me, it did not. 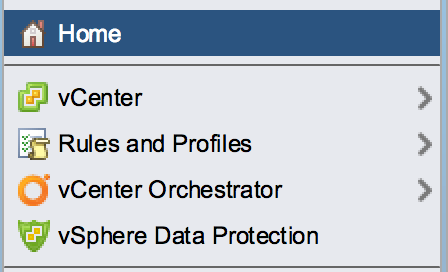 As you can see in the image below, vCenter does not have the vSphere Data Protection. In order to resolve this problem I accessed https://<vCenterIPAddress>/mob. From there log in with your Administrator account, whatever that might be. From there you will need to select “content”. From there you will be presented with another screen that will show you all of your extensions and provide some methods at the bottom. Verify that extensionList[“com.vmware.vdp”] is listed. You will need to select “UnregisterExtension”. After selecting “UnregisterExtension” a popup will be presented. Enter “com.vmware.vdp” without the quotes and select “InvokeMethod”. Once this has completed, you will notice that extensionList[“com.vmware.vdp”] is no longer listed. After all the steps above have been completed, reboot your vDP VM by right clicking on the virtual machine and selecting “Restart Guest OS”. 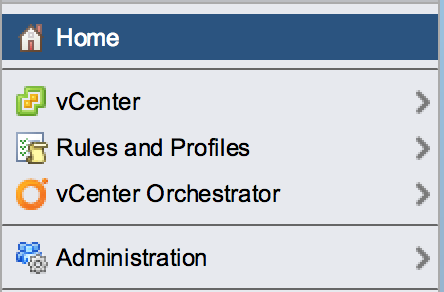 Once it reboots, log out of the vCenter Web Client and log back in using your credentials. This should present vSphere Data Protection extension in your vCenter. Hopefully this will help someone because it ate up a good portion of my time. This worked for me. Thanks very much for posting this as I found it very quickly and I’m sure it saved me a lot of time. Thank you for the comment. I’m glad it worked for you. I spent hours trying to solve the problem! worked like a charm. Thanks so much for taking the time to post this! I was working in this issue for a week. Thanks a Lot!!! You are a very good professional!! vdp extension disappeared.. can not get it to come back!! help if possible! Does it matter if you have com.vmware.vdp2 as well? I’m not sure. I would probably go ahead and remove it and just re-add it if it’s needed. Thanks Matt, this post saved me a whole load of time 🙂 I had the same problem using VDP 5.5. 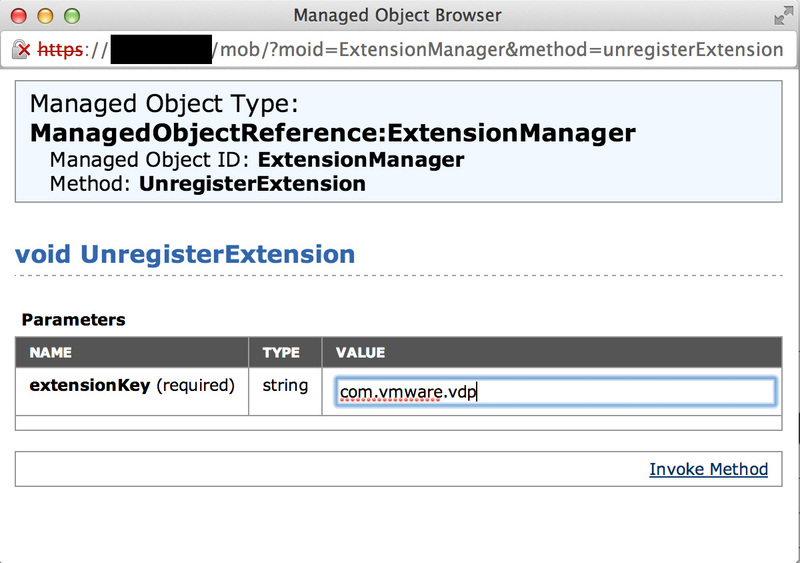 My Managed Object Browser displayed ‘com.vmware.vdp2’ in the extensionList property, as per Michael’s comment above. I removed that as per your instructions, and all is now well. It also displayed ‘com.vmware.vdp2.config’, by the way, which I left in place. If you have VDP 5.5 release or later, you will want to remove the “com.vmware.vdp2” and “com.vmware.vdp2.config” extensions. One step that will save some time with this process is instead of rebooting the VDP appliance, you can SSH or Putty to the vDP appliance and use the command ’emwebapp.sh –restart’ (two hyphens). This will redeploy the plugin after the Tomcat services restart. (You may need to wait a few minutes after the command returns. Thanks for sharing, I just had a similar experience. I had to do one more step beyond what you shared, that is to restart the Windows service for “VMware vSphere Web Client”. After which, log back in to vSphere Web Client and the plugin shows up. Thanx a lot. Merci from switzerland, i was going crazy because all tasks where OK but no interface to work with the damn thing. You save me a lot of time, or to be correct, i wouldnt have figured out how to solve that issue. Thanks for the post, a combination of Greg Sparks and Jason Yeo’s recommendation fixed it for me with vDP 6.1.1 and VCSA 6 U1. Im stuck with the same issue. But it did not help me. Hello I can solve with a couple of extra steps, which the problem you have ?? I perform delete the two libraries ” com.vmware.vdp2 ” and ” com.vmware.vdp2.config ” extensions , then turn off my VDP , After this restart the vCenter , lit my VDP and before starting the web , restart web services with the ” emwebapp.sh –restart ” command. after 5 to 10 minutes entering the web client and my VDP could already visualize . Just one guy's opinion and hopefully some helpful information.